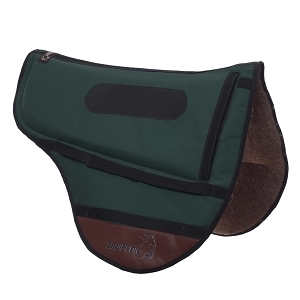 Endurance and English saddle pads. Aptos, CA, (October 3, 2003) – EquiPedic, Inc. today announced that the Canadian National Endurance Team will standardize on EquiPedic saddle pads. 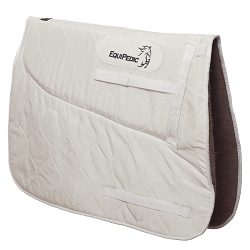 All members of the team will use EquiPedic's revolutionary saddle pad at the 2005 FEI North American Endurance Championships on Oct. 15, 2005 at Fair Hill Natural Resources Center in Elkton, Md. The EquiPedic saddle pad is the only pad that positively affects the horse's physiology in five distinct areas: congruence, compliance, temperature management, moisture management and blood flow management. The EquiPedic saddle pad accomplishes this feat by employing a proprietary combination of military grade visco-elastic foam, phase-change material and natural and synthetic fibers including wool and Holofiber. Holofiber is a proprietary patent-pending textile that works with the body's own energy system to increase oxygen levels, build strength and accelerate muscle recovery to the horse's back and shoulder areas. It is manufactured and marketed by Hologenix, LLC in partnership with Wellman, Inc. In both laboratory and field trials, the EquiPedic saddle pad has demonstrated the capability of increasing transcutaneous oxygen levels to the horse's back and shoulder areas by as much as 30 percent, while regulating the horse's surface temperature. It also acts as a thermostat, keeping the horse cool in warm weather and warm in cold weather with as much as a seven degree variance. The military grade visco-elastic foam offers greater impact load deflection than other brands of pads and provides greater protection for the horse's back. This combination of features has proven to be a significant competitive advantage in grueling 160 kilometer endurance races. "The EquiPedic saddle pad is simply the best pad made," said Yvette Vinton, DVM, a member of the Canadian team. "The entire team is excited about partnering with EquiPedic." Many of the American team members are expected to use the pad as well, since 40 percent of the top ten finishers of the WSTF 2005 Tevis Cup Ride used the EquiPedic pad. PRODUCTS: Has introduced a saddle pad that regulates the body temperature and increases the trancutaneous oxygen transfer of a horse. It's ConforPedic visco elsatic foam inserts offers a more comfortable fit for a horse while absorbing more shock for the rider. ADDRESS: 2570 Apodaca Rd, Las Cruces, NM 88005.